All of the senior instructors at When Hounds Fly are either Karen Pryor Academy Certified Training Partners, or have earned their Certified Professional Dog Trainer – Knowledge Assessed designations, or hold academic degrees in animal behavior. 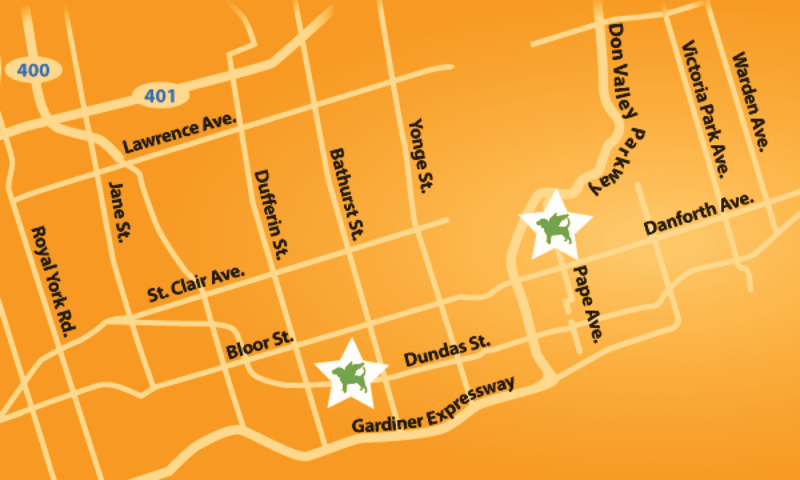 We proudly maintain the highest standards of ANY dog training school in Toronto. We also invest heavily in continuing education and also internal skills development, and are proud to be part of mentoring the next generation of this city’s top dog training instructors. 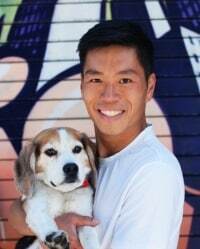 Andre Yeu is the first dog trainer in the Greater Toronto Area to have both graduated from the prestigious Karen Pryor Academy of Animal Training and Behavior and to also be certified by the Certification Council for Professional Dog Trainers. He completed his Karen Pryor Academy study under Steve Benjamin. He founded When Hounds Fly Dog Training in January 2010, starting as the only trainer in a single location, and oversaw its growth to two locations and a total of eight trainers today. Currently he teaches Puppy Socialization and Foundation Skills classes at both locations. Andre is often sought out by the media for his dog training expertise, and has appeared on television programs such as eTalk Daily, Global TV News, and he was the official dog trainer for the hit reality series, CBC’s Over The Rainbow. In print, he’s been interviewed by publications such as Canadian Living and the Toronto Star. Andre grew up in Vancouver, and has a Bachelor’s Degree in Commerce, with Honours, from the University of British Columbia. He lives with his partner, Hyedie Hashimoto, and their rescue Beagle, Phoebe. Phoebe passed her Canine Good Neighbour test in 2018. With his previous rescue Beagle, Petey, Andre enjoyed training and competing in Rally Obedience. Petey had earned his Canine Good Neighbour and Rally Obedience Novice titles. Other than dogs, Andre is a fitness enthusiast and participates in Muay Thai and previously competed in triathlon. 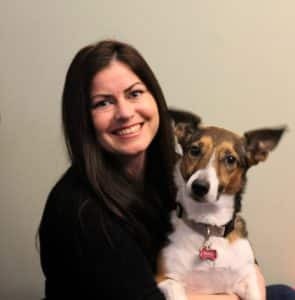 Rachael Johnston is one of the few dog trainers in the Greater Toronto Area to have graduated from the Karen Pryor Academy of Animal Training and Behaviour, and also be certified by the Certification Council for Professional Dog Trainers. She completed her Karen Pryor Academy study under Helix Fairweather. 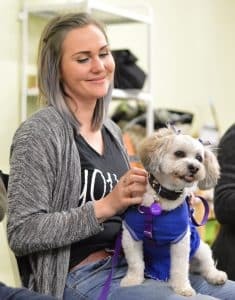 Over ten years ago, Rachael got her start in positive reinforcement training as a volunteer, a mentor and instructor at Sit Happens in Calgary. She graduated from the Karen Pryor Academy in 2009, studying under Helix Fairweather. Rachael loves training dogs! It fills her with joy to see wagging tails and bright eyes as each dog uses their amazing mind to learn all the crazy things we humans want to teach! And it gives her just as much joy to see owners delighted by the discovery that their dogs are such intelligent and fast learners. 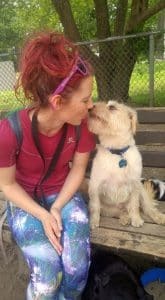 Previously, Rachael was the Operations Manager for Rover Achiever Pet Care and she spent six years walking groups of dogs in some of the most beautiful parks in the city. Rachael lives with her amazing Vizsla, Oscar, who fills her heart to overflowing and who makes her laugh every single day. Rachael instructs Puppy Socialization, Foundation Skills classes and Tricks classes at When Hounds Fly. Sara Russell graduated from the Karen Pryor Academy for Animal Training and Behaviour under Carolyn Clark in 2016, and earned her CPDT-KA in 2017. Sara previously worked at the Toronto Humane Society for over 10 years managing the Feline Behaviour Department where she incorporated positive reinforcement in the shelter’s feline enrichment program, designing and implementing protocols and behaviour modification plans for both animals in the shelter and when assisting pet parents experiencing behaviour concerns at home. Sara is always dedicated to continuing education whether it’s attending yearly conferences, online seminars or reading books to sharpen her training skills and behavior knowledge. Just in 2016, she completed Terry Ryan’s Chicken Camp Workshop, and most recently became certified through the Fear Free Initiative to assist veterinarians, pets and pet owners in making veterinary visits a fear free experience for everybody involved through prevention, management, modification and force free handling. Sara currently serves on the Board of Directors for the International Association of Animal Behavior Consultants (IAABC). 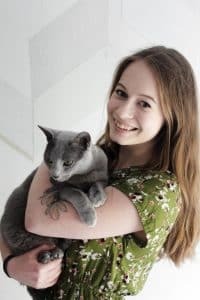 She is also a trainer for the 2017 Jackson Galaxy Foundation’s Cat Pawsitive Initiative which aims at teaching shelter staff and volunteers clicker training skills to modify behavior in shelter cats and assist in making them more adoptable. Hu Wang graduated from the Karen Pryor Academy for Animal Training and Behavior under Laurie Luck in 2016. 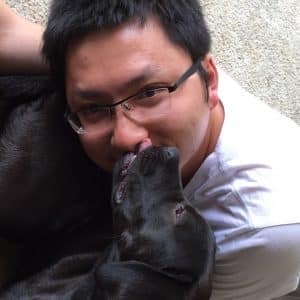 Over the past three years, Hu worked as an apprentice dog trainer in Arlington, Virginia and volunteered at numerous animal shelters in the US. Hu and his wife moved to Toronto with their Beagle/Vizsla mix, Bear in the summer of 2018. Hu has loved animals since he was a child, growing up with dogs in the family. After obtaining a Bachelor’s Degree of Art in Media Production in United Kingdom, Hu worked as TV producer in Beijing, China for five years. During that time, he covered stories about dogs causing societal issues, and he realized that these issues stemmed from society’s lack of understanding of canine behaviour. He wanted to change that, so in 2015, he left the TV industry and relocated to the US to begin his career in dog training. Hu adores Bear who he adopted in Missouri in 2015. Bear has been an amazing training buddy and provided constant support ever since. Hu and his wife have traveled across North America always with Bear by their side. Hu instructs Puppy Socialization and Foundation Skills classes at When Hounds Fly. 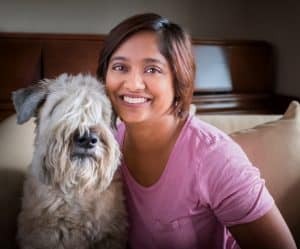 Monisa Nandi joined When Hounds Fly as an Associate Instructor in July 2018. But, her history with When Hounds Fly began in 2011 as a student, when she brought her four month old Wheaten Terrier, Beaker to classes. Since then she’s done over 50 hours of in-class training with him at the the best schools in the GTA. Professionally, Monisa studied under Pat Miller in Maryland, USA, and completed the Canine Behavior & Training Academy Level 1 program in 2015. Monisa has also completed in-class courses in Canine Body Language, Separation Anxiety/Isolation Distress, Reactivity and Aggression, and Resource Guarding. By day, Monisa works in the environmental industry, currently in transit construction, managing a team of 26 technical professionals. Monisa has an undergraduate degree in Environmental Science from the University of Waterloo and a Masters degree in Applied Environmental Science and Management from Ryerson University. Monisa’s transferable skills of observation, objective measurement and critical thinking developed during years of study allows her to bring scientific rigour to her in-class application of learning theory and behaviour modification. Monisa teaches Puppy Socialization and Foundation Classes at When Hounds Fly’s Pape Village location. Kelsey Edwards is an associate instructor at When Hounds Fly. 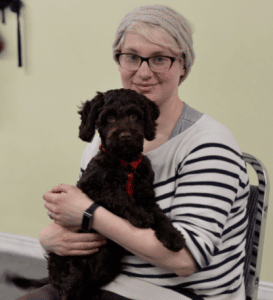 She began her dog training journey by apprenticing here for over a year, assisting classes studying dog training and behaviour under our guidance. She is also a certified force free dog walker through Dog*Tec, and runs a dog walking company out of Liberty Village, called Dog’s World Walking. Kelsey founded her business in 2015, and since its launch has been voted as the top dog walking company in Toronto by BlogTO. Kelsey’s desire to learn more about animal behaviour and training never stops. Through volunteer experiences, pet first aid certification, online & in-person courses, books and video, she has built her knowledge of positive reinforcement training to a deeper level. The most recent course taken by Kelsey was the Karen Pryor Academy Dog Trainer Foundations course. Previously, Kelsey worked in medical software, after graduating from the University of Guelph with a Bachelor of Arts and Science degree (in psychology and biology). Her psychology background has helped give her greater insight into what is happening within the minds of our furry companions. Kelsey lives with her two dogs – Frankie and Sadie, who have both benefited greatly from positive reinforcement training. Kelsey teaches Puppy Socialization and Foundation Classes at When Hounds Fly’s Dundas West location. Erin is an associate instructor at When Hounds Fly, teaching puppy classes and foundation skills. She also owns and operates her own dog walking business, A Couple of Mutts, which was voted Toronto’s Best Dog Walking Company 2017 by The Toronto Pet Daily. Before deciding to become a Professional Dog Walker, she completed her Concurrent Bachelors of General Science and Education, but felt more drawn to the canine classroom than the high-school classroom. A client’s dog, suffering from severe anxiety and OCD prompted Erin to take a strong interest in canine behaviour. Since then, she’s endlessly studied canine behaviour and psychology in order to help more dog owners truly understand what their dogs are trying to tell them. She loves making people think like their dog in order to deepen their understanding of the canine life. Erin lives with her rescued beagle-lab mix Bob, and plays favourite aunt to many of her dog walking clients. Trick training and hiking are their favourite past-times! Stephanie Tran joined the When Hounds Fly team as an apprentice instructor in 2017. She began as a volunteer classroom assistant in early 2016, in order to increase her knowledge and understanding in positive reinforcement training. She continues to read books and take online courses to further her education. She completed her Karen Pryor Academy Dog Trainer Foundations course in 2015 and Dog Emotion and Cognition course by Duke University through Coursera in 2017. Stephanie is passionate about helping reactive dogs. By day, she works as a dog walker, providing 1-on-1 walks for dogs that have fear and aggression issues. Prior to this, Stephanie gained a significant amount of hands-on experience with dogs of all breeds, sizes and temperaments as a full-time Animal Care Attendant at Parker Pet Care for over 3 years. Besides her love of dogs and behaviour, Stephanie is also passionate about photography. She currently lives with her German Shepherd mix, Mila, who she adopted and rescued from Sochi, Russia. Both enjoy trick training and taking long hikes. Claire Kilburn is an Associate Instructor and currently works remotely in Montreal. Claire is currently a student at Concordia, pursuing a major in Environmental Biology. She has a strong passion for nature and one day hopes to have an impact in the field of wildlife conservation. Claire joined When Hounds Fly in early 2015, when she was looking for volunteering opportunities with animals. She spent over a year as a weekly classroom assistant while completing high school. While Claire does not yet have a dog of her own, she does share her life with two cats, Avery and Pepper. Naturally, she’s clicker trained them both and they’re pretty good at Sit and Touch on cue! Sarah joined the When Hounds Fly team as a classroom assistant, and she studied hard to become an associate instructor in 2019. Sarah first found a love of training around horses and she learned to ride and train without the use of tack and other equipment. 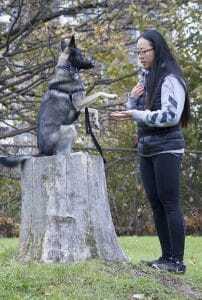 Since moving to Toronto in 2017, she has continued to grow as an animal trainer with the help and partnership of her dog,Percy. Sarah particularly enjoys trick training and became a Certified Trick Dog Instructor (CTDI) with Do More with your Dog in 2018. Together she and Percy have titled up to expert level in tricks, and have the championship title in their sights! 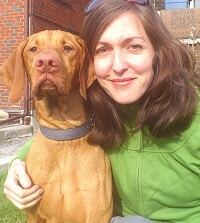 Before becoming a dog trainer, Sarah was an academic biochemist specialising in the digestion of prebiotics. She completed her Ph.D. in 2015 at the University of Newcastle, UK and continued her research at the University of Victoria, BC as a post doctoral researcher. While she assures us that she is happy to leave the lab behind, she continues to apply her skills of objective analysis, deconstruction and presentation to training scenarios. Sarah teaches Puppy Socialization and Foundation Skills at our Dundas West location, as well as teaching one-on-one private sessions.